A National Weather Service Damage Assessment Team has surveyed the storm damage in Marion County. It has been determined the damage was the result of a tornado. The tornado has been rated an EF-1 on the Enhanced Fujita Scale. Damage estimates were consistent with winds around 100 mph. The tornado spun up very quickly approximately 2.5 miles southwest of the Shottsville community along County Road 13, between Reedy Branch Road and County Road 154. The tornado tracked just south of due east for almost the entire length of Marion County with a slight left turn noted near the middel of the path. 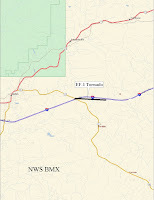 The tornado crossed County Road 11, State Highway 19, State Highway 187, US Highway 43, State Highway 253 and lifted along County Road 34 just after it crossed State Highway 241. No injuries or fatalities were reported. The tornado remained mostly in a heavily forested area and thousands of trees were either snapped off or uprooted. Several mobile homes and one carport sustained varying degrees of damage along the path. The tornado was rated an EF-1 with damage consistent with winds around 100 mph. The total tornado damage path was 25.25 miles long and was 400 yards wide at its widest point. A National Weather Service Damage Assessment Team has surveyed the storm damage in Cleburne County. It has been determined the damage was the result of a tornado. The tornado has been rated an EF-1 on the Enhanced Fujita Scale. Damage estimates were consistent with winds around 100 mph. The tornado damage path was approximately 4.2 miles long and was around 1000 yards wide at its widest point. The tornado touched down along the Talladega Scenic Drive just south of US Highway 78. 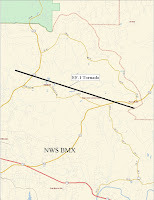 The tornado moved along a slightly left curved path until it crossed County Road 79. The tornado then tracked almost due east and produced its most concentrated damage near State Highway 9. The tornado lifted near the end of Brockford Road in the vicinity of Shadow Lane. Hhundreds of trees were either snapped off or uprooted along the path. Several structures sustained damage and at least 6 of the structures were destroyed. At least 35 homes suffered varying degrees of damage. No injuries were reported. A National Weather Service Damage Assessment Team has surveyed the storm damage in Cleburne County. It has been determined the damage was the result of a tornado. This additional damage path was produced by the same storm that dropped the Heflin Tornado but the damage paths were not linked. The tornado has been rated an EF-1 on the Enhanced Fujita Scale. Damage estimates were consistent with winds around 90 mph. The tornado damage path was approximately 2.4 miles long and was around 150 yards wide at its widest point. The tornado touched down near Exit 205 along Interstate 20, or 5 miles east of Heflin and traveled eastward. The tornado affected areas generally along County Road 114 east of State Highway 46. The tornado lifted just west of the intersection of County Road 114 and County Road 62. Several homes were badly damaged and at least two had significant portions of their roofs blown off. Numerous trees were blown down or were snapped off along the path. No injuries were reported. A National Weather Service Storm Assessment Team has determined that the damage in eastern Walker County was the result of a tornado. The tornado has been rated an EF1 on the Enhanced Fujita Scale. Damage estimates were consistent with winds around 95 mph. The tornado damage path was 9.3 miles long and was 400 yards wide at its widest point. The tornado touched down near the intersection of Birdfarm Road and Snow Lake Road. The tornado then moved southeast and crossed State Highway 257 and State Highway 69 before it lifted near the Cullman County line. 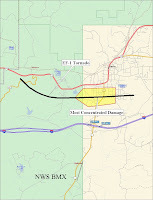 The tornado affected areas near the Sunlight Community, the Burrows Crossroads Community, and the Powellville Community. Numerous trees were either snapped off or were uprooted along the path. Several structures suffered varying degrees of damage. No injuries were reported. This storm did produce additional sporadic straight line wind damage from north central Walker County into northeast Walker County. A National Weather Service Storm Assessment Team has determined that the damage in far northeastern Walker County was the result of a tornado. The tornado has been rated an EF2 on the Enhanced Fujita Scale, due to the damage it produced in Cullman County. In Walker County, damage estimates were consistent with winds less than 85 mph which was EF0 damage, but where as high as 120 mph into Cullman County. The tornado damage path in Walker County was 2.5 miles long and was 75 yards wide at its widest point. The tornado touched down east of County Road 77 near the intersection of Gravlee Junction Road and County Road 15. 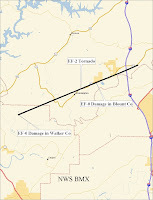 The tornado tracked northeast and entered Cullman County near the intersection of County Road 17 and County Road 19. The tornado appeared to have caused only minor tree damage in Walker County. This storm strengthened and produced significant damage in Cullman County. See the NWS Huntsville Storm Survey for Cullman...Here. Several debris paths were seen across southern Cullman county. The most significant damage occurred along Highway 91, in the vicinity of the town of Colony. Severeal chicken houses were destroyed and numerous large trees were snapped and uprooted. Elsewhere, significant tree damage was seen around Arkadelphia, along county roads 8 and 35. Spotty damage was also seen in extreme northeast Walker County and just east of Interstae 65, near Black Bottom, in association with this tornado. The tornado touched down near a cove along the Tennessee River and moved east northeast, nearly paralleling County Road 14 halfway between the Wright and Rhodesville communities. Extensive tree damage was observed with multiple large trees uprooted and many medium size tree trunks snapped. The heaviest damage occurred to a farm where an all metal barn was completely destroyed and an awning adjacent to another outbuilding was ripped off. The metal roofing was catapulted approximately 1/2 of a mile by the tornado. The tornado touched down along County Roads 181 and 515 at approximately midnight, and uprooted and snapped several trees in it's path. The tornado also produced minor structural damage to an outbuilding. An honor comes this way!